Are you brave enough to venture into the woods of Snoqualmie? Flight time 9hrs from London. 5hrs from NYC. We’re sure you’ve all heard the news by now – 90’s cult classic Twin Peaks is back. And what better way to celebrate than with an open-road adventure through the Evergreen State that the show calls home? Discover sleepless Seattle and its sky-high skyline before lacing up your walking boots and heading out over the snow-capped volcanic peaks and rolling hills of the Olympic National Park. Wedged between those infamous Douglas Fir trees, you’ll explore Snoqualmie, home not only to countless adventurous pursuits, but to the mysterious town of Twin Peaks. From scenic flights to the ultimate outdoors experiences and Dale Cooper’s favorite cherry pie, Black Tomato have the ultimate behind-the-scenes scoop. For any adventure in the Pacific North-West, all roads start in Seattle. Spend your first few nights at the Inn at the Market, our chic waterfront bolt hole, right by the exciting Pike Place market. We’ll furnish you with your own set of All-American wheels to take to the tarmac for the classic American road trip, but before you speed off – Seattle has a sight or two up its sleeve worth seeing. 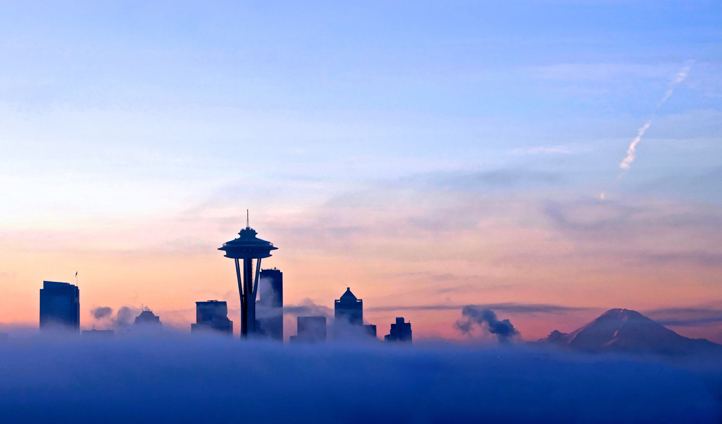 Not a place for those with a fear of heights, Seattle is best seen from 605ft high, atop the Space Needle. Shoot your way to the top of this towering monument where epic views of the downtown skyline framed by the Olympic and Cascade Mountains in the distance, are waiting to fill your camera roll. Back down at sea level, you’ll then enjoy a private cruise around the harbor taking in Seattle’s history and some less vertiginous views of the waterfront. From buzzing Seattle, escape to the great outdoors and discover Snoqualmie; snuggled between Washington’s picturesque forests, rivers and mountains, it’s an adventure lover’s paradise. Whilst there, we can organize a guide to take you to explore Snoqualmie’s pristine waters which are great for fly-fishing or catching trout, sturgeon, salmon and halibut, as well as delicious shellfish and spiky rockfish. 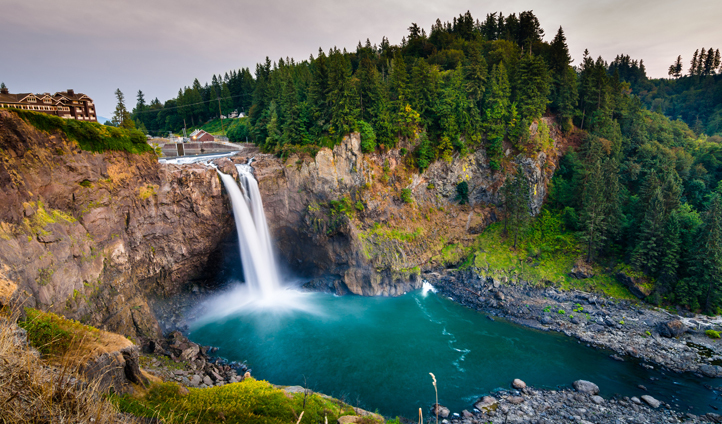 But Snoqualmie isn’t only famous for its outdoor pursuits – it’s also the star of Twin Peaks, doubling as the seemingly picture-perfect town. If you watched the original show, you’ll recognise Snoqualmie Falls from the opening credits, with its thundering water rapids crashing 270ft into the rock pool below. The real icon of your visit to Snoqualmie though? Your hotel. On checking in at Salish Lodge & Spa, you may think you recognise this location from the show too. That’s because you do; the hotel doubled as the iconic Great Northern Hotel and home base of the lead character, FBI Agent Dale Cooper. You can even toast to the cherry pie and coffee loving agent, with the hotel’s own Dale Cooper cocktail, served in The Attic. Whilst in Snoqualmie, you will no doubt want to visit Twin Peaks High School, the Double R Diner, Ronette’s Bridge, Giant log and the Sheriff’s station, but you should be sure to leave time to climb the most-climbed peak in the USA, Mount Si. Hike the four miles to the summit and take a moment to catch your breath as you look out over astounding views across the Puget Sound and Olympic Mountains. Whilst for an alternative, more quaint wilderness experience, hop aboard the Northwest Railway Museum’s antique train to brush up on all things locomotive. Being so close to the Yakima Wine Valley, it would be a crime to miss out on the chilled serenity of this region (and the wine, of course) so stop off and begin discovering all of Yakima’s delicious tipples. Most wineries in this region are boutique, family-run operations so hop between wineries as you cross this sun-kissed region, sampling all the distinct flavors and varieties. You’ll then spend a few days winding down and enjoying the tranquillity of Lake Quinault, located to the south of Olympic National Park. The National Park is heaven for explorers, with an intoxicating mix of rainforest valleys and glacier-capped peaks breaking through the clouds. Surround yourself with colorful and fragrant wildflowers, wispy commutes of wandering clouds and glaciers cracking under the pressure of millions of years of ice. Trek over green hills and witness sights straight out of a picture book, with only the sounds of nature for company. For the last day of your epic Washington adventure, return to the cultural hub of Seattle where we’ve organized a romantic scenic flight over the city. You’ll take in brilliant views of Ballard Locks, the Space Needle, Seattle’s downtown skyscrapers and even Bill Gates’ Estate. We’ll even arrange for you to be flown to a private location on one of the surrounding islands for an intimate candle-lit dinner to round off your epic Washington adventure in true Black Tomato style.